You’ve probably seen it already: Starting a formula in Excel with “=+” (equal-plus) instead of just equal. So why do people use the “=+” instead of just “=”? Is there any meaning? This article describes the background of the equal-plus signs, the advantages and disadvantages. What does the equal-plus sign mean? 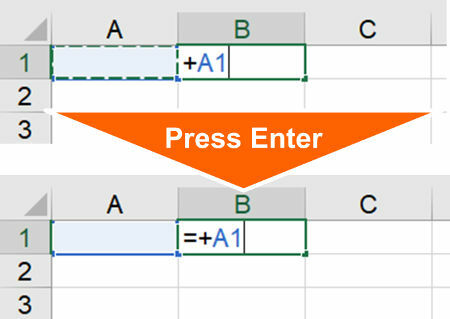 If you type +A1, Excel automatically adds the equal sign. Lotus 1-2-3 is a spreadsheet program and according to Wikipedia, it “was the IBM PC’s first killer application”. However, the last version was published in 2003 and support ended in 2014. Entering formulas or values in Lotus 1-2-3 you could use the “+”-sign instead of “=” like in Excel. In order to welcome Lotus 1-2-3 users, Excel tolerated entering formulas just using the “+”-sign. It automatically adds the “=”-sign before so that formulas are converted. The “+”-sign stays. 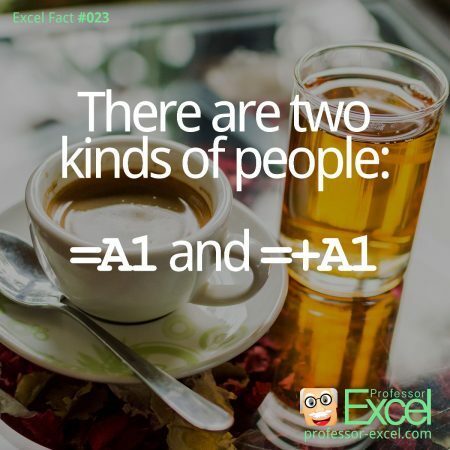 First of all: There is no harm of the =+-sign in the beginning of an Excel formula. With that in mind, let’s talk about advantages and disadvantages of using equal-plus instead of just equal for Excel formulas and calculations. The = and + signs on the US keyboard layout. Lotus 1-2-3 users don’t have to change their behavior of entering formulas in Excel. The “+”-sign is also located on the number pad like on the image on the right-hand side. So if your hand is there you don’t have to move over to the letters. The additional “+”-sign has no significant impact on the calculation performance. Same counts for the file size. It makes formulas slightly longer and therefore more difficult to read. It could confuse other users who don’t know the details about “=+”-sign as you do now. If you following the basic rules of model-building, you either type values directly into the cell (with no calculation). You don’t do calculation with values inside a cell, instead you properly label input cells and link to them. For example, you don’t write =12,3+32,1. Instead, you set up two cell, each of them having one value. In a third cell, you do the calculation with the input values, e.g. =A2+A3. That means, you never need an equal or plus sign on the number pad. Instead, you rather need letters to start typing formulas or brackets. Because of that, the equal sign should be faster to reach because (on the US keyboard layout) it’s located next to the backspace without pressing Shift. So it’s faster typing “=” instead of “+”. There is one exception: For different keyboard layout, often the equal and the plus-signs are in different positions. For instance, the German keyboard layout requires to hold the Shift key for typing “=” whereas the “+”-sign doesn’t. It looks – and this is my personal opinion – “dirty”. Maybe it sounds similar, but the equal-plus sign for starting a formula in Excel doesn’t have anything to do with the double minus sign. 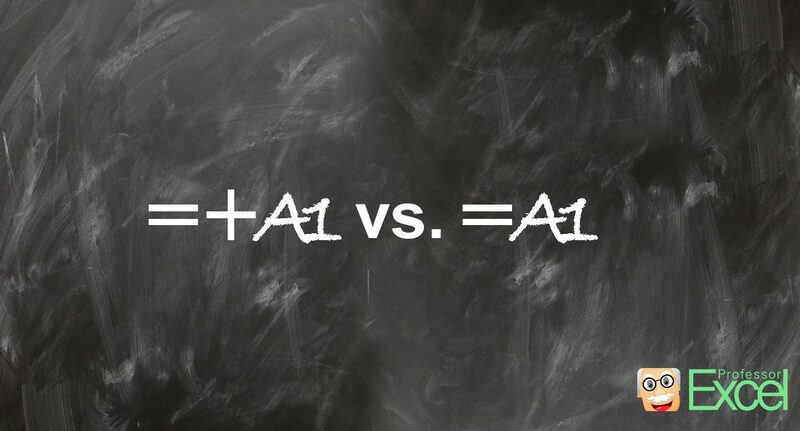 The double negative converts TRUE and FALSE in formulas to the number 0 for FALSE and 1 for TRUE. When do you need that? For example in the SUMPRODUCT formula (please refer to this article for more information). 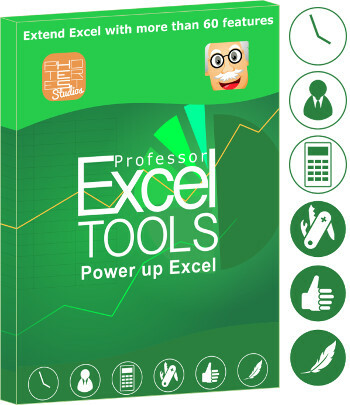 Clean all Excel formulas with ‘Professor Excel Tools’. There are two methods to remove all “=+”-signs in Excel. Use the replace function. Press Ctrl + H on the keyboard to open the Replace window. Now replace =+ by just =. You can further set the scope to the complete workbook. One word of caution: This method removes all =+-sign, also within text cells. 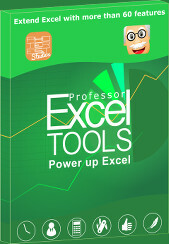 Use Professor Excel Tools. 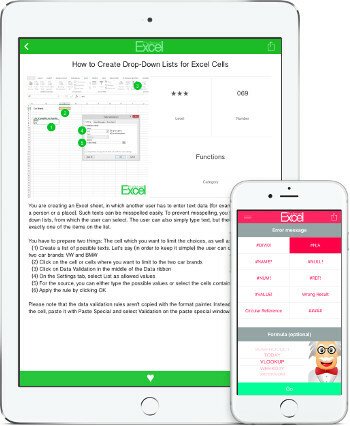 Our popular Excel add-in has a function to clean all formulas. It replaces all “=+” by “=” and also can remove all sheet names within formulas, if the formula refers to the own worksheet. It’s very convenient, because it only regards formula cells. 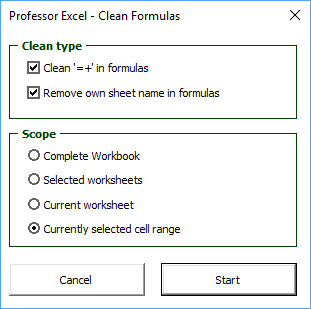 When I receive an Excel file containing formulas with equal-plus signs, I usually have the following thoughts: Someone wants to show that he or she is an Excel expert by not using the “normal” way of typing formulas but rather using the more complicated way. Unfortunately, I get the opposite impression. The author of the Excel file didn’t use the simple way but rather the dirty, more complicated way. That’s not good for an Excel file. What do you think? What is your opinion about the =+-characters at the beginning of an Excel formula? Was the information helpful in this article? 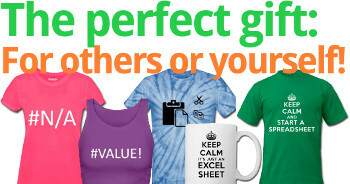 If yes, why don't you subscribe to our free, monthly Excel newsletter? If no, please let us know what to improve. How to keep formula instead of value in formula bar inspite of using + sign in formula?